For many years, Latter-day Saints were led to believe that Joseph Smith translated the Book of Mormon by looking directly at the gold plates that he supposedly dug up out of the ground that had been buried by Moroni, the last living Nephite, in the fifth century AD. This same Moroni is said by LDS leaders to have come back as an angel almost fourteen centuries later; Moroni introduced Smith to the plates in 1823, allowing him to take them home in 1827. Look at the painting carefully. Joseph Smith is peering down at the gold plates, with his fingers running across one of the plates of the unsealed portion. (Since it is taught that only one-third of the plates were unsealed, it appears that he’s almost at the end of his translation.) The candle light provides illumination, with a quill pen standing on the table to the very left, symbolizing that this portrayal is during the time of translation. We assume that Oliver Cowdery is sitting on the other side of the table writing down Smith’s words. 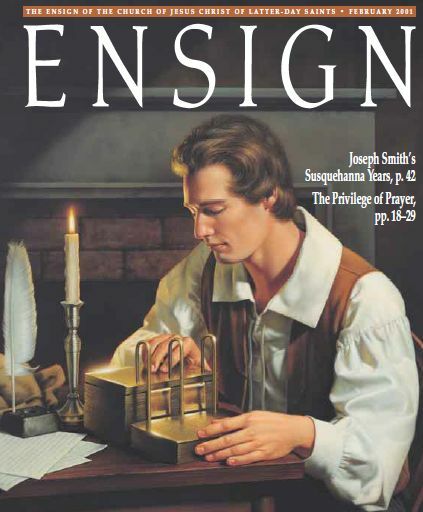 The conclusion any objective observer would have when looking at this painting is that Joseph Smith is translating the plates, letter by letter and word by word, by literally looking at the plates. 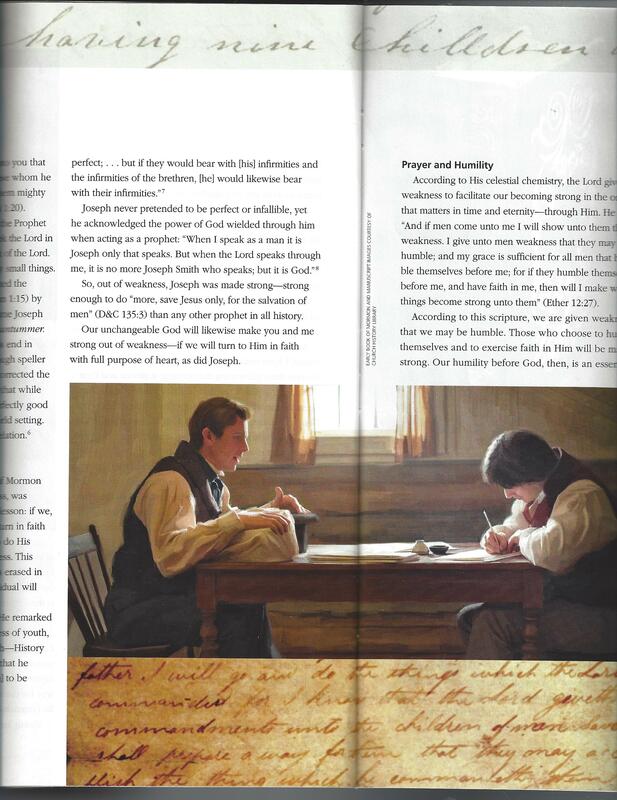 Notice, that the scribe (we assume it is Oliver Cowdery) sits on one side of the table, writing down what Joseph Smith is saying. The plates are covered in a bag, a much different portrayal than what is depicted in the first painting. A top hat sits behind the plates, as only an eighth (or so) of the hat can be seen. Smith’s hand rests on the hat, as if he is steadying it; an informed audience would assume that a seer stone rests at the bottom of the hat. (For those not “in the know,” the hat can hardly be seen and would not disturb the mindsets of those who still think Smith looked literally at the plates for his translation.) Smith has just lifted his head after getting the translation from the rock and is giving the words to Cowdery so he could write them down. It wasn’t until 2015 when a Gospel Topics Essay admitted that the seer stone was used in the translation of the Book of Mormon. (See MRM’s review of the essay here.) 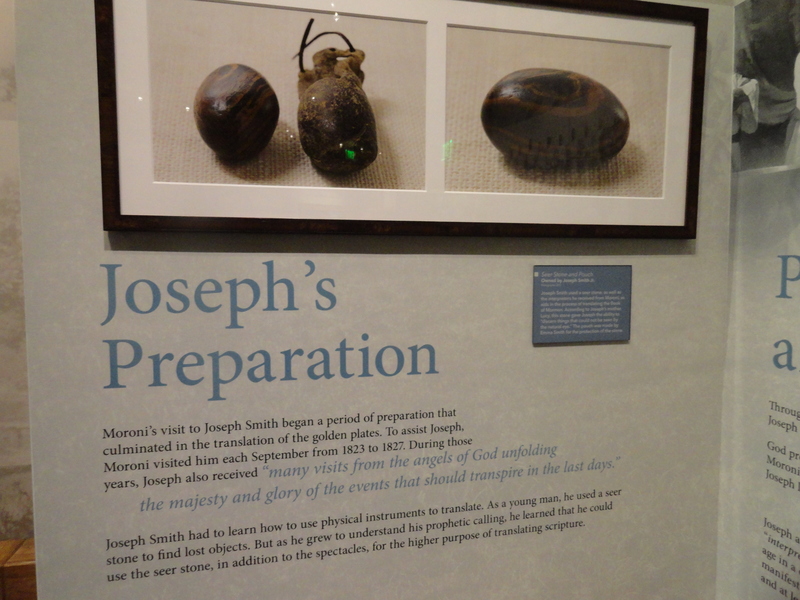 Today there is a display in the Church History Museum (across the street from Temple Square) portraying the actual seer stone. Take a tour with us at the museum by clicking here. These are questions every honest Latter-day Saint ought to ponder.